Brighton5 is a reaction to the growing problems young people are facing with social media, device addiction and pressures at school and college – there is a mental health crisis that is showing no sign of going away. It is a crisis that is particularly affecting girls – one in four has depression before they are 14, and hospital admissions for girls who self-harm have almost doubled in the last 20 years. We decided that we couldn’t just sit by – we wanted to do something to change the situation. As parents and god-parents of teens, we have direct experience of the issues facing young people and, importantly, worried parents. Brighton5 is bringing local teenagers together to create and produce video content that will be distributed through schools and colleges. Teens will work together to share their stories in a positive and creative and safe environment to gain an understanding of issues that affect their mental health, such as device addiction, self harm and negative body image. They will learn skills in production, animation and music and work in teams, building relationships and working with expert adult mentors. If your child has a mental health issue the average waiting time for a referral from your GP to CAMHS (Child Adolescent Mental Health Services) can be over 18 weeks in some areas of the UK. (Youngminds.org, Aug 2018) That’s a desperately long time to watch your child suffering. The ultimate aim of the videos is early prevention, to let teenagers know that they are not alone. Knowing that there are other teens out there tackling issues in a positive way will help them to gain confidence to understand and even share their own stories. We want these videos to reach as wide an audience as possible through distribution in schools and colleges as well as online and on social media channels. Brighton5 is led by three local business women who have a background in television and social media production. Their impetus was the seeming disconnect between parents and their teens - the social media generation. Mental health problems and self-harm are on the increase, particularly in teenage girls, with research showing that a fifth of 14 year-old girls in the UK self harm (BBC News Aug 2018). Brighton5 aims to use technology for positive purpose by giving teens access to gadgets and devices. With them, they will produce engaging, dynamic and fun content that other teenagers will relate to. Brighton5 have partnered with The Greater Brighton Metropolitan College (3,000 students), three local secondary schools (2,500 pupils each) and Sussex Police. WHY IS IT CALLED BRIGHTON5? The idea came about when Brighton5 founder Daisy Cresswell’s 17yr old daughter and four of her friends were sitting round her kitchen table discussing important issues that were affecting them at the time. Her kitchen table became their safe place to share their stories. That’s when Daisy realised teenagers connect, share and support each other far more than they would with an adult. They have their own language, their own way of communicating. So Brighton5 was created! This project has grown to include many teens and will act as a template for roll out throughout the UK. The existing support network for teens in need is diminishing fast – particularly around mental wellbeing. The number of child and adolescent psychiatrists has fallen by 6.3% in England over the past four years. Kent, Surrey and Sussex have only 3.75 child and adolescent psychiatrists per 100,000 children. In London, the tally is around 17 per 100,000. 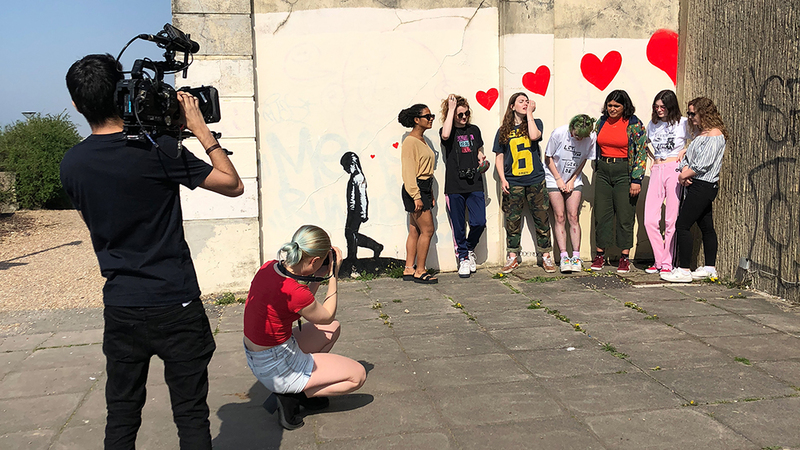 We started this project just over a year ago and we have Brighton teens already involved in creating our cowdfunder video, running our social media accounts, designing T-shirts, creating animations, illustrations, photography and even writing music. This summer we were successful in securing investment from SE Assist and have also put our own money into the project. Brighton5 is supported by local schools and colleges as well as Sussex Police. We are creating a radio pilot for parents/carers that will air on Radio Reverb – watch this space for news! We would like to give a huge thank you to everyone who gave their time (and brought their kit!) 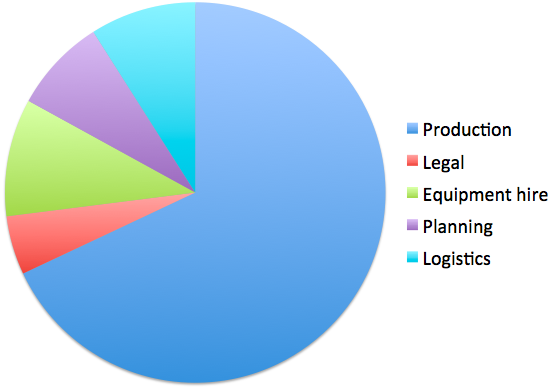 to make our crowdfunder video happen. Our budget has been checked and endorsed by CCC, Commercials Cost Control, who have over 30 years experience in costing video production. 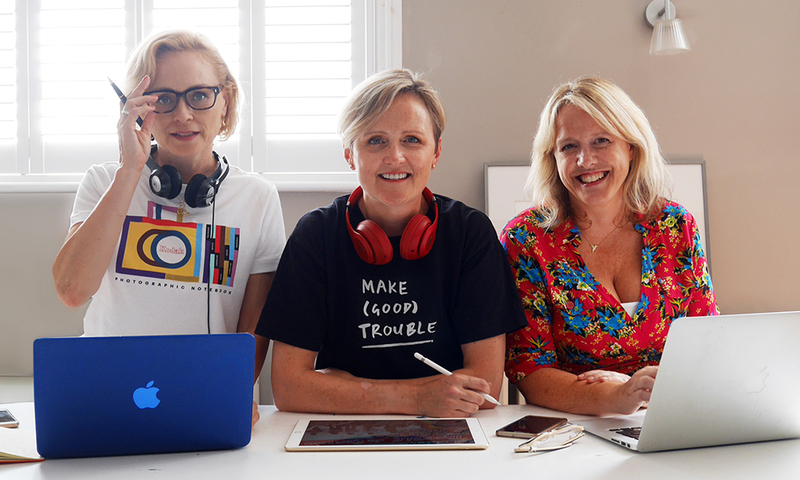 Daisy Cresswell, Founder (centre) - Daisy set up Make (Good) Trouble productions with her sister Tayler in 2018. This is their second venture together, having spent a decade developing digital strategies and social media content for TV and radio shows including Mr Selfridge, Alan Carr Chatty Man, The Last Leg and Holby City. Daisy is mum of two teenage girls and is the driving force behind Brighton5, Make (Good) Trouble production’s inaugural project. Tayler Cresswell, Co-Founder (left) - Tayler is responsible for creating and developing the Brighton5 radio show and podcast as well as heading up the social media offer at Make (Good) Trouble productions. Previously, Tayler managed the social media for BBC Radio 4’s The Archers for five years, building their social media audience from scratch. Alongside her sister Daisy, Tayler has been instrumental in developing content strategies for broadcast shows and production companies, notably Sky, ITV, BBC and Channel 4. Jane Keating, Executive Producer, TV (right) - Jane is responsible for creating and developing the Brighton5 outreach videos for schools and colleges at Make (Good) Trouble productions. Jane has been actively working in the TV industry for the past 19 years, where she worked as Producer and Assistant Producer on Celebrity Big Brother, Fame Academy and Super Nanny to name but a few. For just £1 you'll be listed as a Founding Member of the Brighton5 supporters team and listed on our Supporters page on brighton5.com. We'll be super grateful if you could tell your friends, family and colleagues to give #1forBrighton5 - thank you, you're amazing! Access All Areas pass for you / your teen to attend a filming day. * Plus an Interactive Lanyard for your teen as a keepsake (thanks to Barclays Eagle labs). Plus you'll receive a pair of VIP tickets to attend the red carpet screening of the films, followed by a talk given by the founders and teens and a personalised video thank you from our teens. Meet Brighton5! Our team of professional film makers and teens will come to your workplace and storyboard, film and edit a promotional video (up to 5 mins) for your company. Plus your logo in the Brighton5 film credits and on appropriate marketing material. Plus pair of VIP tickets to the red carpet screening of the Brighton5 films, followed by a talk given by the founders and teens and a personalised video thank you from our teens.